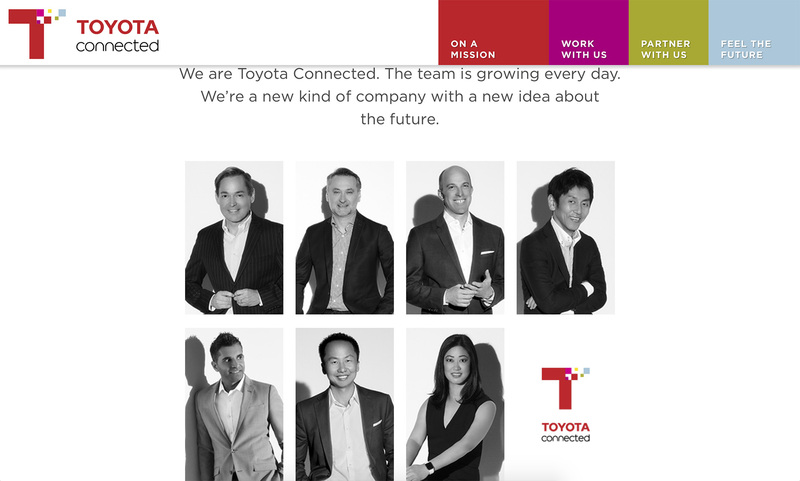 I was commissioned by Toyota Motor North America to partner with them on Toyota Connected, their new AI connected car services in cahoots with Microsoft. The shoot objective was to capture new promotional branding images of the lead team members of this new venture so the company can use not only on their website but also all their press releases to come in the following press announcements. Vehicles would study their owners habits and as the technology improves, will seek ways to make themselves helpful. For instance, while you and your family are driving out to the lake this artificial intelligence technology would suggest local outdoor recreation stores where you could stop for accessories and make recommendations on your favorite types of restaurants on the way to your final destination. “Toyota Connected will help free our customers from the tyranny of technology. It will make lives easier and help us to return to our humanity,” said Zack Hicks, Chief Executive Officer of Toyota Connected and Chief Information Officer at Toyota Motor North America. Read more on D Magazine or USA Today. also, view portraits of housewives of dallas star, leanne locken.